My husband’s family has a fun tradition for birthdays. His brothers make birthday cakes for their children, but they aren’t the average sheet cake with plastic decorations on top. The cakes are three dimensional creations and have included a flying Superman cake (yes, he really flew) and an R2D2 cake complete with a top that swiveled. So of course Michael wanted to join in the fun making cakes for our children. When our first child turned one year old, Michael decided to start simple using an Elmo cake pan by Wilton. He learned how to make stars and how to use the different tools. For the second birthday, he made a Blue’s Clues cake using another Wilton pan. Elmo and Blue are now traditions for the first and second birthday for all of our boys. 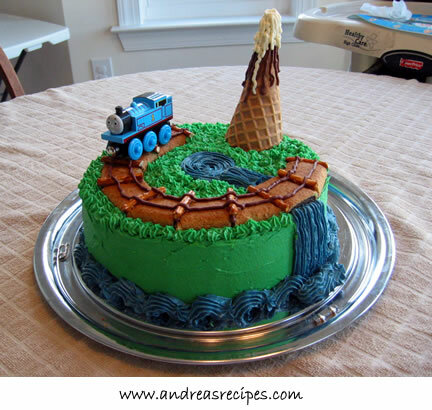 By the third birthday, he was ready to design freestyle cakes, so last year he made an Island of Sodor cake complete with a train track made from fig newtons and pretzels, a mountain made from an ice cream cone, and a waterfall. Everything on the cake was completely edible, except for Thomas himself. The boys loved it! Six months ago, Michael began planning for the fourth birthday cake. He knew that he wanted to do something from The Little Einsteins, and since he’s an aerospace engineer he thought making Rocket would be pretty fun. So last Friday the boys and I made the cakes and Michael spent that night building and decorating Rocket, and I think it turned out really cute. For the cakes, we used two Wilton oval baking pans. As an alternate plan, you could use one 8-inch round pan and one 9×13 pan and then trim the cakes into an oval shape. Frankly, the oval pans performed well and saved us some work, and we’ll be able to use them again in our cake adventures, so we’re glad that we bought them. 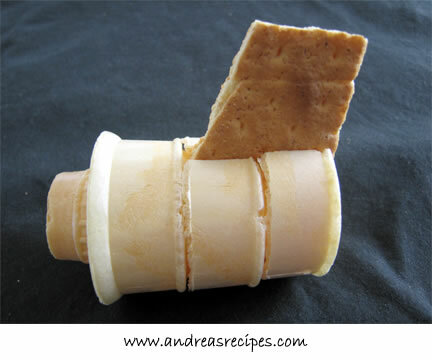 To build the engines (nacelles), Michael used cake ice cream cones and graham crackers. The finished engines were edible, but a bit soggy. He used Wilton gel colors and basic liquid food coloring for the buttercream frosting, both of which are widely available. You can make the cakes, engines, and frosting a day ahead. Keep the frosting in the refrigerator until you are ready to use it, and then allow it to come to room temperature before attempting to decorate the cake. The frosting recipe is adapted from the Wilton website, and makes three cups. You’ll need to make two batches of it. Trying making pink frosting first, then start adding the red gel. You won’t need as much red as you would if you started from white frosting. Make and color the frosting a day ahead and let it sit. The colors deepen with time. If you have a cake and candy supply store near you, check and see if they have Ameri-color or Chefmaster Liquid Gel colors. These are more concentrated and take less gel to make a deep red. I’ve also seen tips for using maraschino cherry juice in the red frosting, but I have not tried this myself. It would add both color and flavor. 2. Pour 2-1/2 cups of cake batter into the small prepared cake pan and 5-1/2 cups of cake batter in the large prepared cake pan. The pans should be about 2/3 full. Bake for 25 to 30 minutes. Test for doneness and remove pans from oven. Allow cakes to sit in pans for 10 minutes, then remove each and allow to cool completely on a wire rack. Don’t try to frost or trim the cake while it’s hot, or it will disintegrate. 3. FROSTING (make 2 batches): Cream butter and shortening in the work bowl of the mixer. Add vanilla and mix for about 30 seconds. Gradually add sugar, one cup at a time, beating well on medium speed and scraping the sides and bottom of the bowl. Add the milk and beat at medium speed until light and fluffy. Keep the frosting covered with a damp cloth so that it doesn’t dry out. 4. Prep the freezer bags for piping. Put the base of a coupler in the bottom corner of a bag and cut away the corner. Add a #3 or #12 tip and screw the coupler ring over the bag and tip. Fill with frosting, squeeze any extra air out of the bag, and twist the top. 5. Yellow Frosting: Put 2 tablespoons of frosting into a small bowl. Squeeze a few drops of yellow coloring into the frosting and stir with a popsicle stick. Start with a small amount of color and add more as needed until you have a bright yellow. Put all of the yellow into the freezer bag with the #12 tip. 6. Blue Frosting: Put 2 cups of frosting into a small bowl. Squeeze a few drops of blue coloring into the frosting and stir with a popsicle stick. Start with a small amount of color and add more as needed until you have sky blue. Put about 1/2 cup of the blue into a freezer bag with the #3 tip. 7. Red Frosting: Put the remaining frosting in another small bowl. Squirt 20 to 30 drops of the liquid red food coloring into the frosting and stir. This gives the color a good strong pink base to work from. Start adding the No Taste gel coloring a little at a time, stirring as you go until you have a deep bright red. Put about 1/2 cup of the red into a freezer bag with the #3 tip. 1. The cakes: Level the tops of the cake as necessary using a serrated bread knife or a cake leveler. Place the large cake layer on the plate. Lay the small cake layer on top of the large layer with the ends of the ovals aligned. Position the end of the top layer approximately 1/2 inch away from the end of the bottom layer. This will be the back end of Rocket. Use the serrated bread knife to trim the back end of the top layer so that it slopes down toward the bottom layer. Trim the top edges of both layers to round them a little. Take the spare trimmings and lay it on top of the top layer. Shape with your hands and knife to make a rounded top. 2. The engines: Set aside 2 of the ice cream cones. 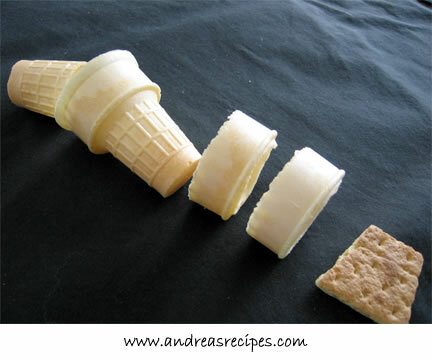 Using the X-Acto knife, cut away the bottoms of the other 4 ice cream cones, saving the tops and 2 of the bottoms. If the cones have a flared top edge, cut that away on the two rings but not on the uncut cone. Set aside two of the cone bottoms. Take the four “rings” and cut a groove in each about the width of a graham cracker. Take 2 graham cracker squares and trim each so that it’s shaped like a fin. To assemble the engines, insert a bottom cone piece into an uncut cone leaving the bottom hanging out. Position two rings around the bottom of that cone with the cut grooves aligned, and then insert the graham cracker fin into the grooves. 3. Use a spatula to cover the top and sides of the bottom layer with the red frosting. 4. Cover the sides of the middle layer with the blue frosting. 5. Cover the rounded top layer with red frosting. 6. To make the headlights, pipe some yellow frosting into two small circles on the front of the bottom layer. 7. Pipe the red frames on the blue windows and detail lines around all edges on each layer. Pipe 5 vertical lines on the bottom layer, one in the front center, and two more on each side, evenly spaced around the cake. Pipe one line on the top layer from front to back. Pipe a circle of frosting on the very top of the cake and then insert the lollipop, leaving about 1 inch of stick visible. 8. Frost the engines using red on the top fin, the outsides of the engines , and on the front part of the engine that sticks out. Pipe some blue frosting in the cavity between the outside edges and the inside cone. Pipe some blue frosting on the back of the engine (the exhaust). Pipe red detail lines on the sides and around the base of the fins. 9. Adding the engines: To finish the cake, lay the frosted engines on the plate next to the back of the cake and connect them using a chopstick that runs through the cake. Find the approximate horizontal center of the engine and use the X-Acto knife to drill a hole through it about the diameter of the chopstick. Insert the chopstick through the back of the cake, running one side to the other. Gently push each engine onto the chopstick through the holes you drilled. 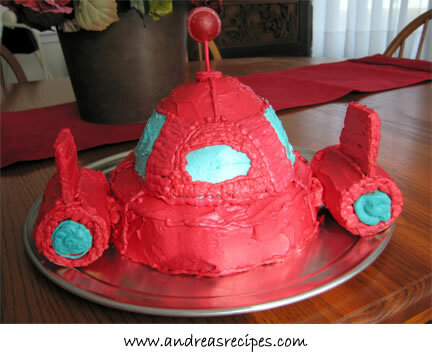 Pipe some red frosting onto the chopstick to fill in the area between the cake and the engine. Way to go Michael. I am so impressed! Thanks for sharing your idea and giving instructions, my soon to be 3 year old loves the little einsteins so i will try to make this. Jane & Scurry: Thanks, and please let us know how your cakes turned out! I’M SURE YOU’RE MAKING ALOT OF “LITTLE EINSTENS” EXTREMELY HAPPY OUT THERE! 😉 I KNOW MINE WILL BE!!! Chris & Dawne, thanks for your nice comments! Michael is very happy that his project has inspired others to try the cake! I tried your cake, came out good for the first attempt. My kid got so happy when he saw it he started singing the little einstein song. His turning 2 next month and I just couldn’t find anything original for a cake. the only thing I changed was that I created the engines with actual cake in it. put on a cupcake pan the normal amount you would pour for regular cupcakes and then put the icecream come on top (upside down), bake the same and now you have a cake enginet too. Nancy, glad to hear that your cake turned out well. Good idea for the engines! My boy is obsessed with Little Einsteins, and I also was looking for something like this. This is awesome. Thanks for sharing it, and for the clear instructions. Thank you for this. It is awesome!! THANK YOU so much for posting this! I did a search to see if there were any Little Einsteins cake pans… and wala! My sister-in-law does cakes, so she said this would be no problem. My little 3-year-old-to-be will be delighted next week! Today is my son’s birthday. He LOVES Little Einsteins. I’m making him a Little Einstein cake right now to take to his school. I wish I would have seen your picture sooner. Great Idea will try your cake next time, can’t wait! I’m on a mission, bye!!! Your cake is incredible! If my MIL won’t make it I will try to see if hubby will. I can totally mess up a recipe so I won’t try but it is amazing! I love it! 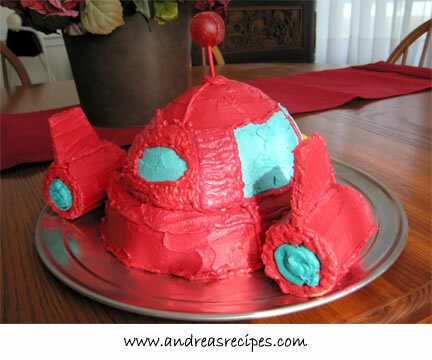 This is the best Rocket cake I’ve seen online. the fact that it is 3D is great! I love the lollipop on the top and how creative for the the engines! I hope to ahve this cake made for my little one’s 3rd Bday in July. I LOVE this cake! My baby boy is now 1 and he has been watching lil einsteins from day one! I made this cake for my daughter’s third birthday last weekend and it came out great. Thank you for the idea and the great directions. Everyone at the party was very impressed and my daughter just loved it. I had bought the little einstein figures to put around the cake and it just made it perfect. Thanks again! Everyone, thanks so much for the kind comments on Michael’s cake! I’m glad to hear that many of you have made the cake (or had someone make it for you) and that it turned out well! Thank you so much for posting the Thomas the Train picture! My son turned 1 over the weekend and I modified your husband’s design to include a dinosaur instead of the train and train tracks. It turned out so much better than I had hoped and it all started started with you (I’ve never attempted a design on my own)! We made a Rocket cake for our son’s 2 birthday (almost a year ago). For the back “fins,” we used Twinkies and iced them. I absolutely love this. Thank you so much for the instructions. My son is not even 1 yet and he’ll sit still and watch little Einsteins. Wish my luck on his 1 yr party! Awesome! The basic cake was easy enough to figure out but I love the Ice Cream cone engines, who would have thunk!! Still trying to figure out a buzz lightyear cake but we have a 1st birthday and a 3rd birthday in the next 6 months an they’re both huge Einstein fans so Rocket’s gonna be made one way or another!.. Thanks for posting this! I have a son who has SPD who will be turning 2 on Saturday. The only thing in this universe that keeps him happy is the little einsteins. He loves them so much. They are an integral part of our daily therapy. I hope this cake works out well. We will let you know. Great! I want to design a LE cake too for my son’s 3rd bday. Tip- you can use Koolaid powder to help obtain red icing. This is so COOL!!! My daughter is turning 2 soon and she LOVES rocket! I am doing a trial run of the cake this weekend, if it turns out half as good as yours I will be ecstatic! My little girl, Jordyn, loves rocket! I hear RA RA RA ROCKET! All day long. So for her 3rd birthday *Sept.29*, I will be creating Michael’s Ra Ra Ra Rocket for her! Instead of smoothing frosting, I believe I will use the Wilton star tips, just for a little something extra. THANK YOU SO MUCH FOR THE INSTRUCTIONS!!! THE ENGINE IDEA IS BRILLIANT!!! BIG HIGH 5 TO MICHAEL TO HELPING L.E. MOMS!!!!! I am so going to give this a try. My son Adamo turns 1 in October and he so loves Little Einsteins. And everyone does the same thing, bob the builder, mickey etc. And here in Melbourne, Australia, the little einsteins are not popular (as yet) so I wanted to do something different. You have made my life easier. I was so worried but now i am stress FREE!!! I do wish that it will come out as good as yours. Might have to do a practice run. Once again, thank you, thank you!!! Great Work!! A great big THANKS to you for an amazing idea! I love it and cannot wait for my daughter’s birthday in November. The only thing I will change is to use twinkies for the rocket boosters with the graham crackers. (Like I need an excuse to buy twinkies!) Lovin’ that Tootsie Roll Pop too! Thanks again! I’m in awe! I’m not good at making cakes, have tried many times. You should start a business, cause I know I would pay for someone to make an awesome cake like that, and I’m sure others would too!!! Thanks so much for sharing your masterpiece! I just made this for a friend’s 2 year old’s birthday and it was a HUGE hit! I “star tipped” the icing and it turned out really nice! I think you have extreame creativity you an ispiration to all! Thanks again for sharing your masterpiece and creativity. I will definitely keep your website on my favorites for future ideas. You have made many boys and girls happy on their special day. Will this work with a box cake mix? And how about making it half the size? I only have 3 kids coming to my 4 year old’s party. Any suggestions? Awesome!!! Thank you so much for sharing. My son is turning two next month, and I was just looking for an image that I could have scanned on top of a sheet cake. Your cake is SO much cooler. I’m going to try it!! Thanks again for the detailed instructions. Exactly what I’m looking for for my daughter’s next birthday! Thank you! How incredibly fantastic! Finding birthday cake ideas that aren’t “cookie cutter” is a dauting task! Your husband is a genius. My son really loves the Little Einsteins! Hi! I am ASTONISHED!!! 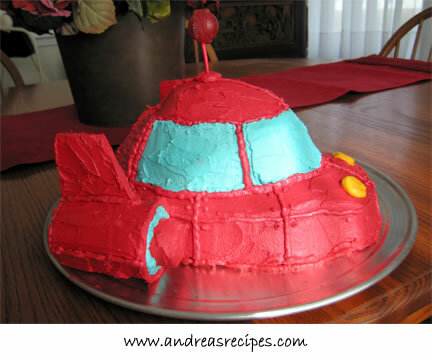 I was also looking for ideas for a birthday cake and I saw yours… my little daughter loves the little einsteins, I will try to make it myself thoughI’m not so good at cooking but I’ll take the challenge anyways! Thanks for sharing your great ideas and for the detailed instructions!!! Thanks SO much for your detailed instructions on this — it looks awesome. I’m going to be trying this for my son’s 2nd birthday and I can’t find oval cake pans anywhere. I’ve searched JoAnns, Michaels, Williams-Sonoma, A.C.Moore, Bed Bath $ Beyond — you name it, I’ve tried it. Did you purchase yours online? The only ones I can find online are a $38 set of four from Wilton, which when you throw in shipping costs is way too much to spend on two pans (since I won’t use the other ones). Hi Jen: The set of four oval pans that you mentioned is exactly what we bought, although we found them at Michael’s last year and used a 50% off coupon to save some $$. If you want, you could use one 8-inch round pan and one 9×13 pan and then trim the cakes into an oval shape. Either way you’ll have some batter left over and could make cupcakes with the rest. Have fun making the cake! THANK YOU, THANK YOU, THANK YOU!!!! I made the cake yesterday and spent all evening and this morning making the engines (they still don’t look as good as yours). I just wanted to say that this is the most awesome cake and I love you for putting up the directions!!!! Could I ask, how did he make the engines stick together? I use an 8-inch round cake and one half of the Wilton Soccer ball. I got the soccer ball pan last year for the Baby Einstein caterpillar from Michaell’s for like $10. GOOD LUCK TO EVERYONE THAT ATTEMPTS THIS CAKE! When my son saw it last night (half way done) he should “Einstein, vrooom, vroom, ROCKET!” He’s turning two and loves it! Thank you sooo much for the pics and directions!!! My son turns 2 in February and loves the Little Einstein’s, I think if I start practicing now I might be able to get this down 🙂 great job guys, it’s amazing!!! I’ve endeavoured to make this cake for my son’s 2nd birthday party this Sunday. Instead of the ice cream cones, I’m going to use rice krispies and roll them to the right size and put the graham crackers on while it’s still hot. Thanks for the tip about Michaels. I called a few in my area, found one and snagged a coupon. I made the cake last weekend and it came out FANTASTIC… I was even impressed with myself (lol). Wow, you are my hero. I had my son’s 2nd birthday party in September (yep, I’m late posting my thanks) and found your website. He loves the Little Einsteins so I suprised him with this cake. When it was unveiled he was open-mouthed shocked and started singing “Rocket, Rocket”. Thank you for helping to make his 2nd birthday one to remember! Andrea…this cake is amazing. I am attempting it this week. I was going to have it made, but our bakery was going to charge me $165! I don’t think so! Anyway, how many people did this feed? I’m afraid I won’t have enough cake. Thanks! Hi Kim! I’m glad to hear that you are going to try it. We made our cake using the two smallest cake pans in the set, which would have served 15 people (approx). You can use larger cake pans as necessary, just increase the amount of cake batter to fit the pans. Allrecipes.com has a Cake Pan Size Conversions chart you can use for reference. OMG!!! Thank you for the detailed instructions. 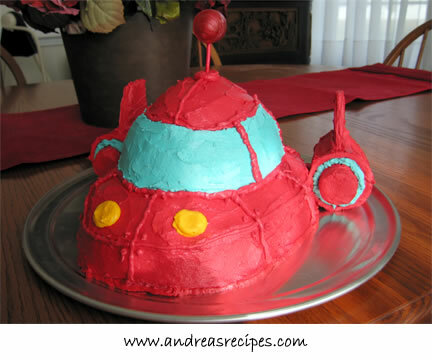 My daughter is in love with the Little Einsteins, so my husband and I are attempting this cake for her 2nd b-day. We have about 50 people coming, so we will probably do the big ovals, and make cupcakes to coordinate. The cake pan conversion chart is a great resource. We will let you know how it goes. The cake idea is awesome, I’m definitely going to try it for my son’s second birthday! Thanks so much for sharing. Wow! We did a trial run for this cake this weekend–it worked great! Excellent instructions and pictures. Only an aerospace engineer could have created this one! Thank you so much. My soon-to-be three-year-old son loved it and I’m sure the next one will be hit at his birthday party in a few weeks! Maybe I’ll try to send some pictures if I can. Ra ra ra for Rocket! Wanda & Tawanna, I hope your cakes turn out well! Good luck! Shannon, we’re glad to hear that your trial run was a success! Do let us know how the party goes. Awesome cake! My son is turning 3 and LOVES the Little Einsteins. I even had to figure out how to make special curtains for his Little Einstein room. He is going to love this! I LOVE this cake. my husband and i are going to make it for my son’s 1st b-day next week. he loves the little einsteins. we are wondering how many people does this cake serve. let us know. thanks! Hi Becky. For the size pans we used (see Equipment), I think the cake would serve 15 to 20 people depending on how large you cut the pieces. thanks for posting such clear instructions. My son will be 2 in 3 weeks and I am heading out to get supplies for the cake today. He is so obsessed with the little einsteins that this is exactly what we were looking for. Thanks for the post!!! I’m going to try this for my son’s 3rd birthday party in a few weeks. I don’t have oval pans, but will try making round or rectangle cakes and cutting them to size. Will also try making the cake engines as someone suggested. Can’t wait to try this! This is absolutely amazing. Thank you so much for posting this wonderful information. You husband did an incredible job on that cake. I hope to make something close for my son’s third birthday this spring! Thanks again, what a huge help this will be! This is so wonderful. I have been searching for several months for a LE cake and keep coming back to this one. I’m not the best cake decorater in the wrld, but I think with some help from my mom, we can knock this out. Jace will be four at the end of March and LOVES Little Einsteins. I already have the LE decorations on order so this all we need to complete the theme. I can’t wait to try this!!! Thanks so much, you did an excellent job! Hi, I made this cake for a friend for her daughter’s 3rd birthday. I normally don’t “build” things out of cakes… I do a lot of sheet cakes, and tiered cakes, so this style is really not something I’ve ever done ~ It was a challenge no doubt, even for me and I do a lot of cakes! Anyhow, it was fun to try. Very time consuming ~ but well worth it because the birthday girl was more than thrilled with her Rocket cake. Very cool way of making the little engines, I was so impressed. Anyhow, I have a picture posted of my finished product in my cakes photo album on myspace, I am not sure if I am allowed to post links, or if it would even work, but I will post this, and if it’s not allowed, you can delete, and I apologize. One thing I did different, I used an airbrush and painted the cake red so as to get the deep red color without the icky taste that too much food coloring can leave sometimes. You’ll see the bit of overspray on the board. I also piped the frosting on the blue windshield, rather than spreading it, and I used yellow chocolate circles I made for the headlights. Tell your husband I am seriously impressed with his talents! Very cool, thanks for the idea. I started looking at this cake a couple of months ago for my son’s 2nd birthday party. He is adopted and has taken interest in LE. I’m going to make this cake, starting tomorrow, for Saturday. Thank you Michael for your efforts!! I may try the twinkies with the GC’s so that they can be eaten too. I made this cake for my son’s 2nd birthday yesterday. Just a little time saving tip for anyone that lives where a Publix Supermarket is (the south :), you can go to their bakery and they will make just the frosting for you. I took them a picture and they made it to match exactly. They can’t make the cake since it is Disney copyright but they will make their yummy frosting! It is $4 a pound which averages out to about what you would spend purchasing enough red to make your own! Julie, I wish that I could have seen the photos, but I don’t have a MySpace account. I’m sure it turned out great! Tami, I hope your cake turned out well! Jennifer, great tip for the frosting! YOU ROCK! My son is turning 3 on Sunday and this will be a hit. Thanks for doing all the hard work and making it easier for me! I made it for my son and it turned out awesome. THANKS AGAIN! I made this cake for my son’s 2nd birthday a couple weeks ago and it was a huge hit!! He actually wanted to play with the cake as a “toy”!!! He was so excited that only he got to eat it. It was almost like it was his first birthday all over again as he wouldn’t let anyone else have any cake!! He just kept saying “my rocket cake”. Luckily I planned on having another cake for everyone else in anticipation of him not wanting to share!!! Thanks for the detailed instructions on the cake, it really made my son’s (and my) day!!!! His excitement was priceless!!! Thanks for the awesome instructions. I made this for my nephew and he flipped. We used sugar free cherry koolaid in the frosting to make it more red & add some punch and it worked out really well. You made his day! im making the rockets engines right now and cant wait to see my finished project. thanks for the instructions! Thanks,for making a GREAT cake. My son’s birthday is next week, and I was looking for ideas on the rocket. So glad I found you. Great job! Thank you sooooo much for this post! My son’s going to turn one on April 4th and I’ve been searching everywhere for an idea on how to make a special cake for his big day. He loves watching the Little Einsteins (it’s the only thing that keeps him entertained) and I wanted to use that as his theme. Again, thank you so much. I passed this along to my mother in law. She makes all the cakes in the family. To say my son loves Little Einsteins is like saying we like to breath. When Little Einsteins is on he becomes a zombie. He carries around his rocket and Leo stuffed dolls everywhere. He’ll be two this summer and I can’t wait to see the look on his face when he sees his rocket cake. Thank you so much for sharing your knowledge with families across the world. Its a way to make our celebrations a little bit more special. Thanks so much for sharing your cake baking talents with other families. We think birthday’s wouldn’t be the same without a homemade cake. My son is turning four next month and LOVES the Little Einsteins. He keeps telling me all he wants is a Little Einstein cake (with a hot wheels candle). I am going to make an attempt at this “work of art.” I am very impressed with the thought your husband put into making it. Thanks for being so detailed on the instructions. It is impressive! Thanks so much for the directions on “Rocket”. We made the cake for my son’s 3rd birthday on the weekend and he loved it. Wouldn’t let any body touch it. Not many people in Australia have heard of Little Einsteins so it was really great that we found your site. You made a 3 year old very happy. My daughter is a huge fan and just LOVED the cake! I never decorated a cake before so this was an ambitous project, but it turned out GREAT! Thank you so much for posting the pictures and clear directions. I can’t wait to hear about your next adventure. Wow! This cake is amazing! I just got done making one for my 3 year old little boy. I used a 10 inch and 8 inch rounds and froze them and cut them into the shapes of ovals. I didn’t it was going to turn out the way I wanted but it turned out amazing! Thanks so much! My little boy will be so excited! I was wondering have you considered making it with fondant as well? I have done a lot of cakes myself and the 3D cakes “look like real” ( as my kids say) if you cover them with it ( the fondant). The structure you have is awesome and I think it has a lot of potential ! Hi Tandoori! The cake would certainly look more professional and polished with fondant, but none of us like the taste of it! We’ve tried various homemade recipes, including marshmallow fondant, and it just doesn’t appeal to us. It seems like a waste to make all that fondant then not eat it, so we stick with buttercream in all our cakes with occasional pieces of fondant for effect. I have to tell you that I have someone in my family that doesn’t like the taste too 🙂 , so I use almond marzipan in their cakes instead. It is miles away from the fondant taste, but it has the look too. I found your image of a creative, beautiful birthday cake on an image search that led me to your blog. I was hoping to use the photo in an hour-long design exercise I am running to inspire people to make creative, unusual, and highly personalized birthday cakes. Would it be alright to use that one image for that one purpose? Crossing my fingers. The cakes are baking now. I forgot to buy the lollipop, cupcakes and graham crackers so it will be back to the store first thing tomorrow. I’ve done some tiered cakes and some basic cakes but this involves a little sculpting and that scares me to death! I am excited to try this cake. My little girl will turn 3 in a few days. I am wondering if this cake is time consuming? Could someone let me know how long it took to make? THANKS! HI Savannah’s Mom! It took my husband several hours to decorate, but he was creating and experimenting as he went and did not have instructions to follow. You do need to make the cakes ahead so they have time to cool completely before decorating, so factor in that time as well. I am very nervous about trying this, but I’m gonna give it the ole college try and see what happens. I SERIOUSLY doubt it will be the masterpiece yours was, but I’ll try anyway! I scored the oval pans on ebay for a fraction of the list price on Wilton. My son’s big day is next month, and I’m sure I’ll have many a blog post on my attempt to bring Rocket to life! Thanks for the recipe! Oh wow, Michael and Andrea! You have made a mommy one happy person! I was looking for something to do for Lex’s big 2, and you did it! He’s a total mockingbird when LE comes on. He sings with them, talks to them, and kisses the tv when they come on. I can’t wait to try this recipe. Hi Andrea-I’m going to make this cake for our 3yrs old party. Have you ever used whip cream for the frosting? I have not used a whipped cream frosting for this cake. If you want to go that route, the frosting for Dorie Greenspan’s Perfect Party Cake is really yummy. You can vary the flavors, of course. I was just wondering what type of cake you used for this. Would a box cake mix work? I just think it might be too soft, let me know what you think. Thanks so much, this will be lots of fun. Thank you so much for posting this! I have been wondering how in the world I was going to make a Little Einstein cake for my daughters 3rd birthday! Last year I made her the Elmo cake with the Wilton cake pan and it looked amazing. I’m excited to tackle this challenge! I know she is going to love it! Oh my goodness! I’ve been searching and searching for a rocket shaped cake mold – but this one – this one is incredible! I hope I have enough patience and time to make it for my soon to be three year old son!! Thanks for the instructions, tips and wonderful pictures!! I’m hoping to make this cake for my son’s 2nd birthday. Do you have any experience with food color spray? I used it on a fire truck cake I made and it made things very easy. Thanks! Hi, I am going to try this for my 3 year old’s birthday in a few weeks, thanks for the detailed instructions! I have a few questions (never having made a cake from scratch before!) I pulled up the choc birthday cake recipe you cited above…is one of those recipes enough to make this cake? And, if I make the cake on a thursday and put it in the fridge should it still be ok for a saturday party? Thanks! Mira, we’ve never tried the colored sprays, but I hear they are very efficient. Karen, one chocolate cake recipe makes about 6 cups of batter, enough for one 9×13 or two 8-9 inch cakes, so it all depends on what size pans you use for this cake. I would be very interested if you have any pictures of the R2D2 cake. My husband had one when he was a little boy and now our two little boys love Stars Wars so much I would love to try and make one. Thanks. 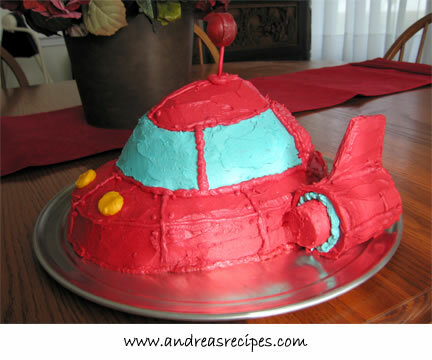 My son’s second birthday is coming up and we are going to try to make the Jet (Einstein) cake. I’m hoping it will be as good as yours!! I’m adding a pic of him with the characters to go in the window of rocket so we’ll see how that turns out. Thanks so much for this recipe it has really come in handy. Great work!!! My son’s #2 birthday is coming up and he is in love with Rocket, we have to “pat, pat” with him if we’re in the room when Rocket takes off. Andrea, thank you so much for posting this. 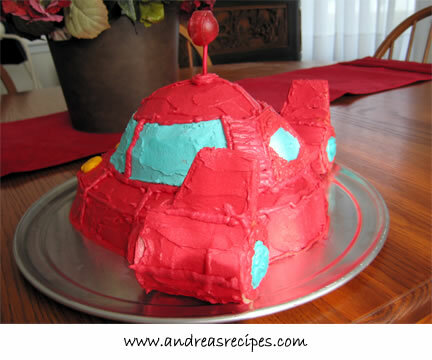 I’ve been looking for a while for a Rocket Cake with a how-to, and you and Micheal have done it!! Do you have a recipe for a light-coloured cake with sour cream in the batter? I feel that this cake may take some carving, and I want one that is dense enough to take it, but still nicely textured. I am thinking of the chocolate batter recipe you mentioned, but would also like a light cake as well for another layer. Thanks! Thank you so much for the ideas and pictures! My 2-year-old-to-be loves Little Einsteins. I wanted to make a cake using this theme, but was at a loss. Thank you!!!! This cake is AWESOME!!! My daughter is having a party at her school for her 4 and a half birthday (since her birthday is in the summer). She is insistent upon having a Rocket cake. I’ve been trying to talk her out of it to no avail. I did a search on Rocket cakes and found your instructions. They are clear and I’ll give it a try next week. She will be SO happy (and the envy of her class I’m sure). And, your ideas are so neat that I’m sure I’ll be able to incorporate them for other cake ideas as the need arises. THANK YOU!!! The Rocket cake is awesome!! Thank you for the step by step instructions. I tried it this weekend for my son’s 3rd birthday and it turned out great! !-well not as great as yours. I have never tried a 3D cake before. Your instructions were soooo helpful. It took me over 4 hours (including baking time) but well worth it. Thanks again!! You guys ROCK!! Thank you!!! I just made this recently for my daughter’s 2nd birthday. She loves the Little EInsteins and sleeps with her rocket toy! This was such a hit! Thank you Thank you!!!! Great! Thanks so much. I have my heart set on Little Einsteins party for my baby’s 2nd. I’m planning 6 months in advance. My artist daughter is making invitations shaped like rocket. 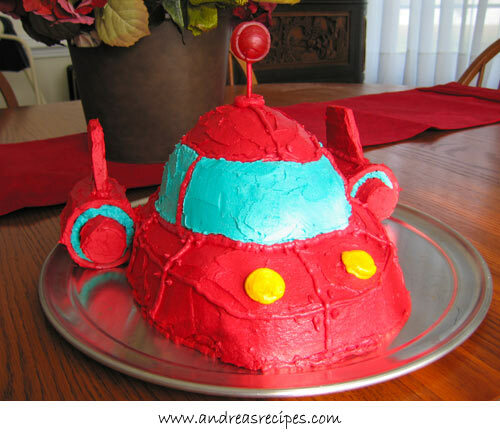 This is a great cake…my nephew is turning 3 and loves Rocket…i am making this cake for him and pray it comes out as good as yours…thank you for the specific instructions!!! So Helpful!! I am thinking of spray painting the cake instead of doing all the food coloring. – I am wondering what your/your husband’s thoughts on that would be. Hi Theresa. We’ve never sprayed a cake, but I think the cake would look great with the colors sprayed on. awesome cake! Another way to deepen red is by adding cocoa to your icing:) I love love love the Thomas cake! I wish I had a boy to make something like that for. Although you never know my girls might want a thomas cake one day! Thanks for the wonderful step-by-step directions. We used this to make a cake for our daughter’s 2nd birthday and it was the hit of the party. And it was super fun, so I think we’ll continue to make creative birthday cakes for our kids for many years. Thanks!! I am want to make this little einstein cake for my daughters 2nd birthday tomorrow. i made two oval cakes last night but used a pound cake recipe that i had….they came out but the height of them didn’t seem right for this recipe. they were only maybe an inch and a half high.. so now i am thinking it isn’t going to turn out right. i just noticed your recipe for your yellow cake mix. When you use the yellow cake recipe, do they come out higher than the 1.5 inches? i am contimplating starting over and making your recipe tonight and use my other cake for something else. what do you suggest? your cake is awesome and i want to try to do the same as i know my daughter will love it. Hi Andrea! Standard cake pans are usually about 1.5 to 2 inches tall, which is what we use. Our cake may rise higher in the middle, but we always level them by trimming off the extra. So the 1.5 inches you have is probably fine. I am ordering the red frosting from a local bakery. Do you have any idea how many cups or pounds of red frosting I would need for this cake? Hi Angela. The total amount of frosting for this cake is 3 pounds, about 6 cups. The red amounts to about 4 cups. Thanks! I made this cake for my son’s birthday party this past weekend. He loved it! I managed to find the 4 pc Wilton oval cake pan set at Hobby Lobby and got 40% off with a coupon so that helped out with my cost. I made his engines out of rice crispy treats and graham crackers. Your instructions and photos were so helpful! I forgot to buy couplings for holding my frosting tips in place, so I couldn’t get too fancy with my frosting and did a lot of it with a butter knife. But overall it went pretty well. Here is a link I posted on my blog with my cake and referred my readers to your site so they can use your great recipes and advice! Thank you so much for your detailed instructions. My 12 year old daughter found this when we started planning my 4-year old’s party. I was a bit skeptical as to how it woudl turn out, but we did it. I used a regular round cake pan for the bottom, then for the top, i used the Pampered chef measuring cup that can be used int he oven. For the red, I used a Betty Crocker cookie decorator and added it to white frosting (if I used pink as base, that may have helped). It wasn’t bright red, but pretty close and it wasn’t pink. My 12 year old followed your instructions for the engines and we pieced it together. I want to try this cake for my daughter’s 3rd birthday in s few weeks. I always have a hard time frosting carved cakes because crumbs go all over the frosting and you can see it. How do you avoid that?